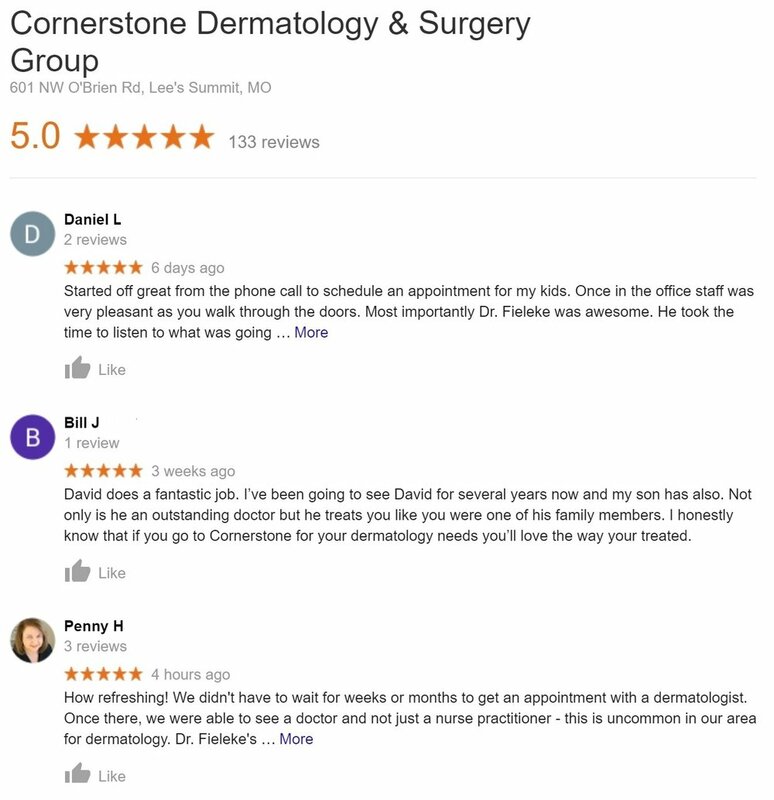 Blue Springs dermatology residents are excited to be within a 25 minute drive from Dr. David Fieleke’s Cornerstone Dermatology and Surgery Group’s office. Dr. David Fieleke is pleased to expand access to dermatological care to Blue Springs, Missouri. Dr. Peter Muelleman cared for patients in this area for more than 30 years. Upon Dr. Muelleman’s retirement in May, 2019, there is no longer a board-certified dermatologist serving the Blue Springs community. Cornerstone Dermatology in Lee’s Summit is just a 20-minute drive from the Independence Event Center via Highway 470 South. With less than a 25 minute drive from Blue Springs, our dermatology staff are ready to take care of all your skin care needs. Several of our Blue Springs patients express how happy they are to be located so close to their residence. We look forward to caring for you and your family too. Please call our office to set up your initial appointment. Once you have an appointment scheduled, you will be provided with access to our patient portal to complete your patient paperwork. If you prefer to print your new patient paperwork, please click on Patient Forms. Print these forms, complete them and bring them with you to your first visit. If you do not have the ability to complete the forms online or print them, please arrive 20 minutes prior to your appointment time to complete your paperwork.